Log College at Neshaminy in Bucks County is founded. It will be important in training evangelists who will become involved in the Great Awakening movement that will occur in the 1730s and 1740s. Riots occur in Philadelphia. The Pennsylvania colony governor will forcefully put down the riots. Anglo-Spanish War breaks out. It only lasts a little more than one year with skirmishes mainly in the Carolinas. George II becomes King of England. History of the Five Indian Nations by Dr. Cadwallader Colden is published. It details information about the Iroquois tribes. Benjamin Franklin creates the Junto Club, a group of mostly artisans who are socially progressive. The first American synagogue is built on Mill Street in New York City. Horses and carriages are banned in Boston Common. It will eventually be called the oldest park in the United States. North Carolina becomes a royal colony. Benjamin Franklin begins publishing The Pennsylvania Gazette. The Old South Meeting House is built in Boston. It will become a key meeting place for revolutionaries and was where the Boston Tea Party meetings occurred. North Carolina and South Carolina are confirmed as royal provinces by the British parliament. The city of Baltimore in the Maryland colony is established. It is named after Lord Baltimore. The Philosophical Society is founded in Newport, Rhode Island which has become a vacation destination due to its spa. The first public library in American colonies is founded in Philadelphia by Benjamin Franklin and his Junto Club. It is called the Library Company of Philadelphia. The American colonial legislatures are not allowed to place monetary duties on imported slaves according to royal decree. Georgia becomes a colony out of land from the South Carolina territory when the Charter of 1732 is issued to James Oglethorpe and others. 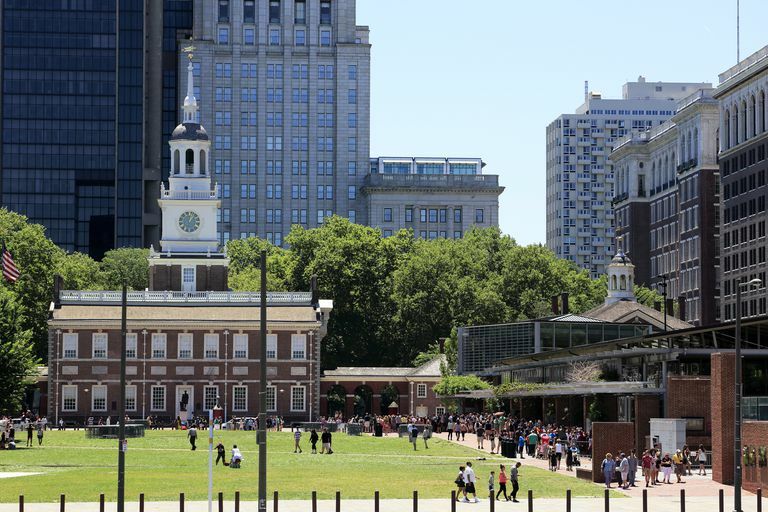 Construction begins on the Pennsylvania State House, better known as Independence Hall, in Philadelphia. George Washington is born on February 22nd in the Virginia colony. The first Catholic church in the American colonies is founded. It will be the only Catholic church erected before the American Revolution. Benjamin Franklin begins publishing Poor Richard's Almanac which will become a huge success. The Hat Act is passed by parliament banning hats to be imported from one American colony to another in an attempt to help London hatmakers. James Oglethorpe arrives in Georgia with 130 new colonists. He soon founds Savannah. The Molasses Act is passed by parliament setting heavy import duties on molasses, rum, and sugar from Caribbean islands other than those controlled by the British. The New York Weekly Journal begins publication with John Peter Zenger as its editor. John Peter Zenger is arrested for seditious libel against New York Governor William Cosby. Jonathan Edwards preaches a series of sermons in Northampton, Massachusetts that begins the Great Awakening. The trial of newspaper editor John Peter Zenger comes to trial after ten months of imprisonment. Andrew Hamilton defends Zenger and he is acquitted because his publication was not libelous since the statements were true. The first American fire insurance company is founded in Charleston. It will be bankrupt within five years when half of Charleston is devastated by a fire. John and Charles Wesley arrive in the Georgia colony at the invitation of James Oglethorpe. They bring the ideas of Methodism to the American colonies. The first city-wide celebration of St. Patrick's Day is held in Boston. The "Walking Purchase of 1737" occurs in Pennsylvania. William Penn's son Thomas employs swift walkers to pace the boundaries of land given by the Delaware Indians. According to their treaty, they are to receive the land a man can walk in a day and a half. The Indians feel that the use of professional walkers is cheating and refuse to leave the land. The colonists enlist the help of the Iroquois Indians in their removal. A border dispute between Massachusetts and New Hampshire begins that will last for over 150 years. English Methodist evangelist George Whitefield, a key figure in the Great Awakening, arrives in Savannah, Georgia. The New Jersey colony gets its own governor for the first time. Lewis Morris is appointed to the position. John Winthrop, one of the most important scientists in the American colonies, is appointed to the chair of Mathematics at Harvard University. Three uprisings of African-Americans occur in South Carolina resulting in numerous deaths. The War of Jenkins' Ear begins between England and Spain. It will last until 1742 and will become part of the larger War of Austrian Succession. The Rocky Mountains are first sighted by French explorers Pierre and Paul Mallet. The War of Austrian Succession begins in Europe. The colonists will officially join the fight in 1743. James Oglethorpe of the Georgia colony leads troops along with Cherokee, Chickasaw, and Creek Indians to capture two forts from the Spanish in Florida. However, they will later fail to take St. Augustine. Fifty slaves are hanged in Charleston, South Carolina when their planned revolt is discovered. Famine in Ireland sends many settlers to the Shenandoah Valley area along with other southern colonies in America. New Hampshire colony gets its own governor for the first time. The English crown appoints Benning Wentworth to the position. Benjamin Franklin invents the Franklin Stove, a better and safer way to heat homes. Nathanael Greene, American Revolutionary War General, is born. The American Philosophical Society is founded in Philadelphia by the Junto Club and Benjamin Franklin. The American phase of the War of Austrian Succession, called King George's War, begins. The Six Nations of the Iroquois League grant the English colonies their lands in the northern Ohio territory. They will have to fight the French for this land. The French fortress of Louisbourg is captured by a combined New England force and fleet during King George's War. During King George's War, the French burn the English settlement of Saratoga in the New York colony. The boundary between Massachusetts colony and Rhode Island colony is officially set by parliament. The New York Bar Asociation, the first legal society in the American colonies is founded. King George's War concludes with the Treaty of Aix-la-Chapelle. All colonies are restored to their original owners from before the war including Louisbourg. The Ohio Company is at first granted 200,000 acres of land between the Ohio and Great Kanawha Rivers and the Allegheny Mountains. An additional 500,000 acres is added later in the year. Slavery is allowed in the Georgia Colony. It has been prohibited since the colony's founding in 1732. The Iron Act is passed by parliament putting a halt to the growth of the iron-finishing business in the colonies to help protect the English iron industry. Schlesinger, Jr., Arthur M., ed. "The Almanac of American History." Barnes & Nobles Books: Greenwich, CT, 1993.